Late Missionary Elijah Lee was called to the Lord's house unexpectedly in the evening of August 25th, 2010 in Santiago, Dominican Republic where he had served the Gospel of Jesus for 15 years. On that sad day he finished a prayer meeting and just stepped out with his two children to go home, but suddenly was approached by two young men who shot him to death for robbery in front of his two sons. He moved to Santiago in 2010 to help Haiti refugees who were forced to enter into Dominican Republic due to the devastating earthquake. 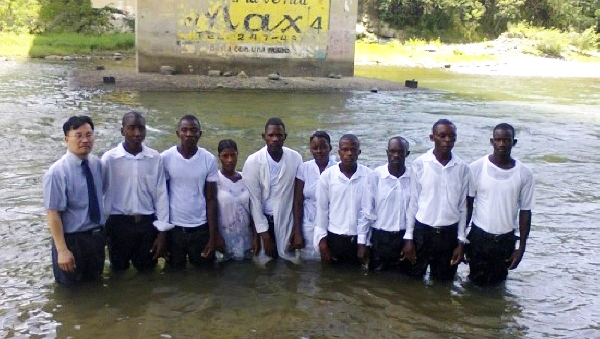 In Santiago the late Missionary Lee planted a church and introduced Jesus to Haitian youth. He ran a local book store to make ends meet. Missionary Rebekah Kim, the bereaved wife, has carried forward unfinished mission work in love and Spirit of God since 2010.